LKM 251215/1958, plinthed in Klipphausen-Sora, December 31, 2014. Photo by dr. Bernd Gross, source: www.commons.wikimedia.org. 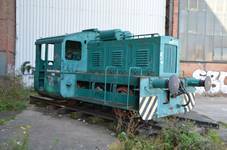 Slightly derelict LKM 251194/1957, photographed in Magdeburg-Buckau on October 4, 2013, by Torsten Maue; source – as above. VEB Lokomotivbau Karl Marx (LKM) of Potsdam-Babelsberg in Eastern Germany, formerly a division of the Maschinenbau und Bahnbedarf Aktiengesellschaft (MBA), commenced operation in April 1947, initially building steam locomotives for the Soviet Union as a part of war reparations. In early 1950s, based on pre-war designs of small two-axle locomotives powered by internal combustion engines, known as Kleinlokomotiven, in particular Orenstein & Koppel types RL7 and RL8, the first generation of post-war small diesels was developed. 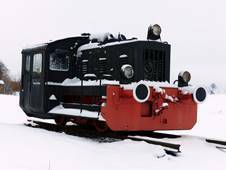 It comprised three types, designated N2 (power rating 30 hp), N3 (60 hp) and N4 (90 hp), power units being supplied by VEB Dieselmotorenwerk Schönebeck. ‘N’ indicated Normalspurlok, or standard-gauge locomotive. Total output of N2 was probably only eleven examples, all for industrial establishments in Eastern Germany. N3 was built in larger numbers: in all, 110 locomotives were delivered, of which eighteen were exported (including nine to Poland). As for type N4, total production between 1953 and 1958 amounted to 253 examples. Many were exported, to Hungary, Bulgaria, Czechoslovakia, Yugoslavia, China and Poland, but the majority went to industrial railways in Eastern Germany; a few were built for the army. In 1958 production was terminated, in favor of new, more modern and more powerful types, such as V10B, V15 and V18. Polish foreign trade enterprise Metalexport purchased 34 locomotives of this type, which were assigned to various industrial establishments. Last six examples were shipped in 1957; further deliveries were not continued, due to introduction of indigenous type 409D from Fablok. Polish N4s, operated solely by industry, did not receive much publicity and very little is known about their service. As far as I know, not a single example has been preserved in Poland. However, comparatively many have survived in Germany and some of them are still operational.